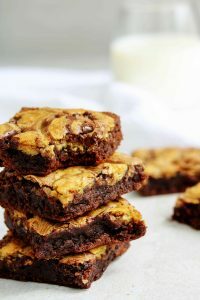 You’d never guess these dense, moist, creamy, chocolate-y, healthy turtle brownies are actually healthy! 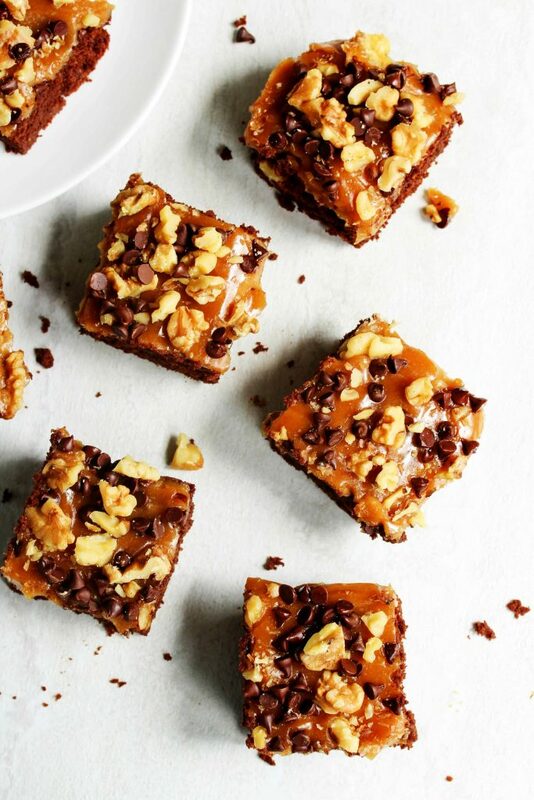 This easy dessert full of walnuts, caramel, and chocolate flavor is sure to be a crowd pleaser! It’s almost summer time, can you feel it!? I mean, literally, can you feel the humidity? Because I can. It’s been raining and humid and hot here for the past two weeks. But that just means avoiding the sticky sweatiness outdoors and doing lots of baking indoors! In particular, baking these healthy turtle brownies. I may or may not have made them 3 times already. 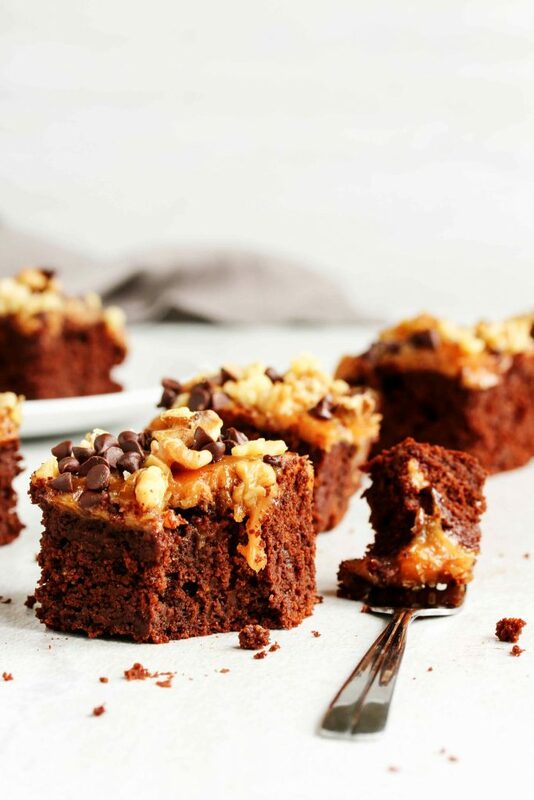 We’re here to talk about theeeeeessssee – ultra luscious, fudgy, chocolatey brownies with a decadently creamy caramel topping, all sprinkled with walnuts and chocolate chips. 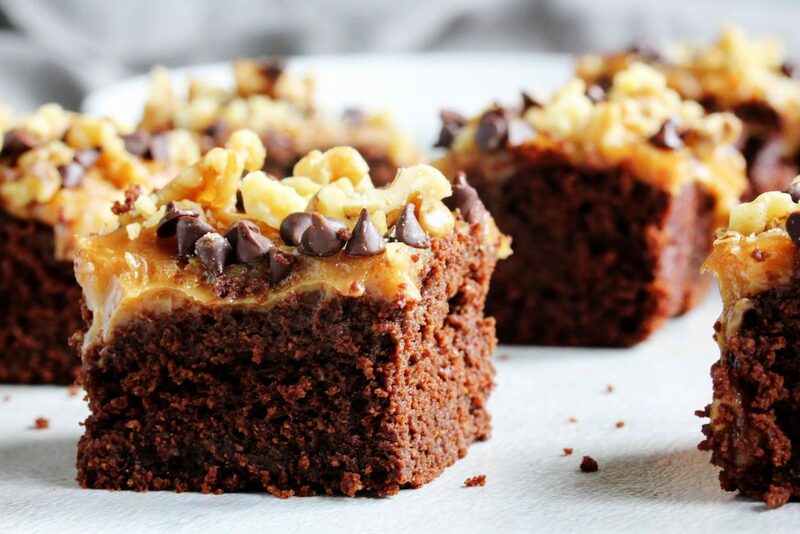 Seriously, they’re the ultimate healthy turtle brownies! They’re just so stinkin’ good! 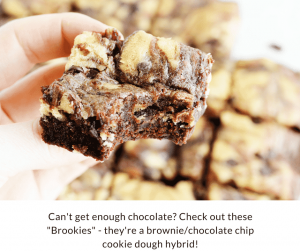 Another reason they’re so good is because they’re so chocolatey (I mean, duh…they’re brownies). But, they get part of their rich chocolate-iness from using unsweetened dark cocoa powder. You can definitely use regular cocoa powder if that’s what you’ve got on hand or prefer a less intense/more mild chocolate flavor. But to me, the chocolatier the better! 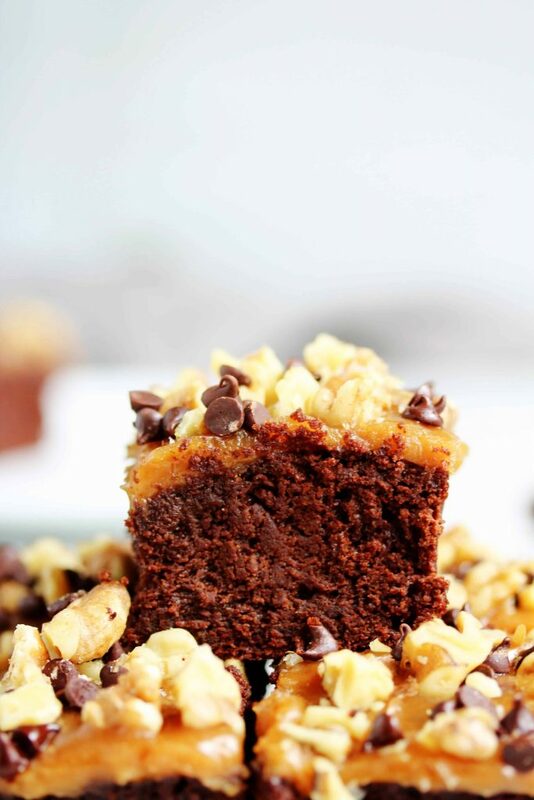 These healthy turtle brownies also make the perfect summer treat! 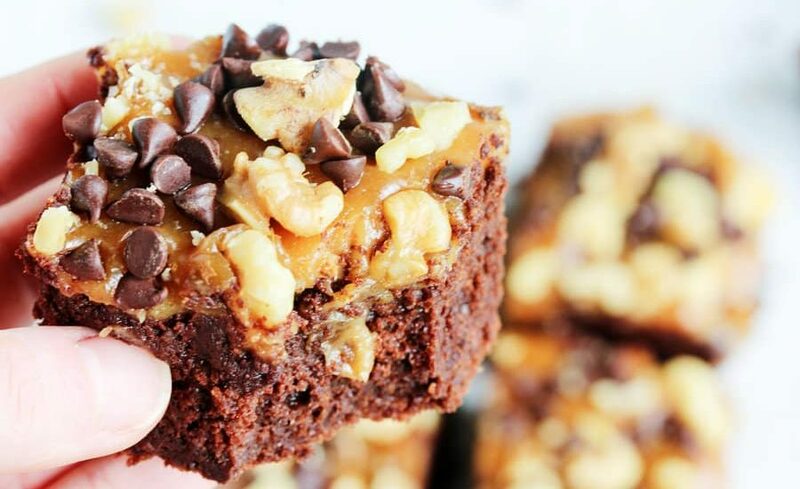 All the summer activities keeping you busy don’t have to be dessert-less because the caramel and the brownie batter can be made ahead of time! 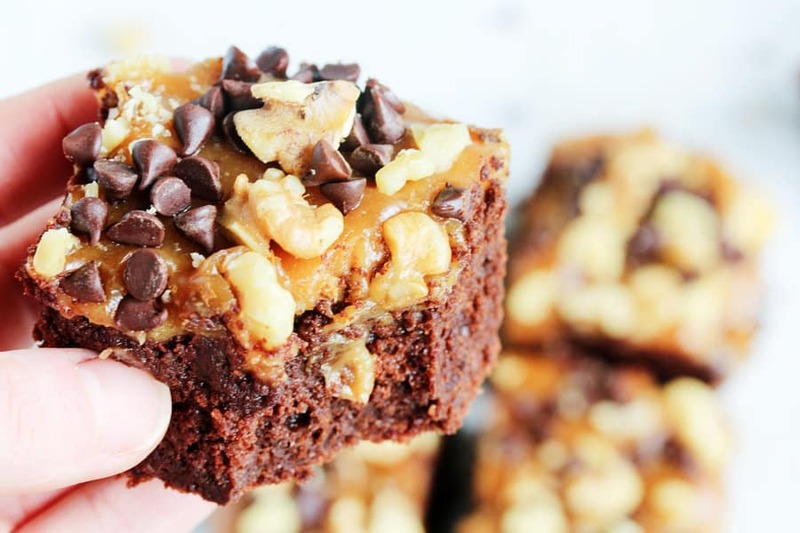 The brownie batter can be made the day before and the caramel can be made up to a week in advance. But trust me, if you’re trying to keep this healthy, refined sugar free caramel in your fridge for a week it ain’t gonna happen! You’ll eat it all by the spoonful before then ;). What’s your fave outdoor activity? 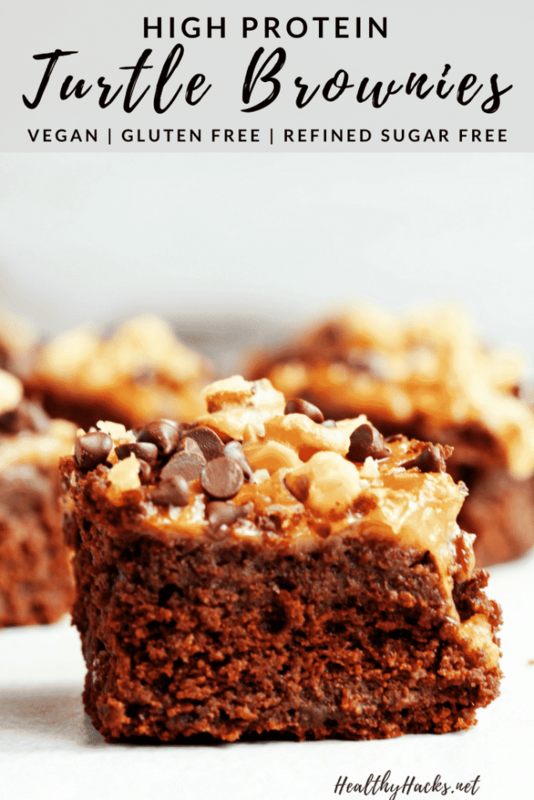 If you make a batch of these healthy turtle brownies, be sure to snap a pic and share it with me on my socials @HealthyHacksRD. I love to see your creations! Preheat the oven to 350 F and line an 8 X 8 square pan with parchment paper. In a small, heat safe bowl, whisk together the cocoa powder and instant coffee. Add the warm water, and stir until there are no lumps. Add the 1/3 cup of chocolate chips, and stir until they’re melted. In a large bowl, whisk together the egg, almond butter, maple syrup, milk, and vanilla extract until completely incorporated (this helps add air to the batter which helps with the texture). In a separate bowl, stir together the protein powder, oat flour, salt, and baking soda. Add the cocoa powder mixture to the wet ingredients and stir together. Add the dry ingredients to the wet and stir until smooth and there are no more clumps. Bake for 18-22 min. or until a toothpick inserted into the center comes out with small crumbs. 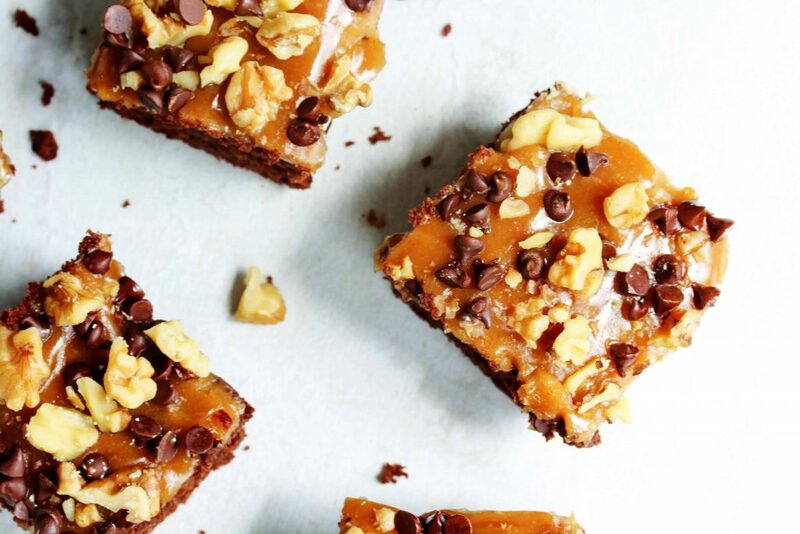 While the brownies are baking, make the caramel: in a medium bowl, stir together the almond butter, milk, maple syrup, cornstarch, vanilla extract, and salt. Allow the brownies to cool slightly once out of the oven (about 10 min. ), then spread the caramel evenly on top. Sprinkle the chopped walnuts and chocolate chips on top of the caramel. 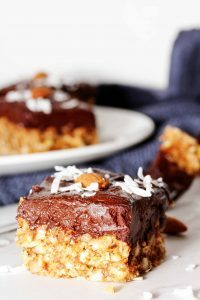 Take a bite and enjoy your lusciously smooth and decadent healthy turtle brownies! *For a vegan option, you can substitute the egg for a flax egg (2 Tbsp flax meal + 4 Tbsp water, stirred together and set aside until thick). Did you cook the caramel?